I walked into my favourite modelshop yesterday and the proprietor was busy unboxing several cases of this kit.Naturally, my eager hands snatched one off the pile and was soon being gleefullyopened to see if what was said about it was true. It is. The kit is everythingone expects of Revell-Monogram. Superb detailing, excellent instructions and agreat decal sheet. The ProModeler boxing has the usual very detailedinstructions with photos of a museum plane to assist you with building themodel. There is also a tow tractor tossed in to the mix. Undoubtedly this ispart of the ProModeler package. You can see the quality of the molding from theimage to the right. You'll also be glad to see that it is standard grey plasticand not silver or any other odd color. 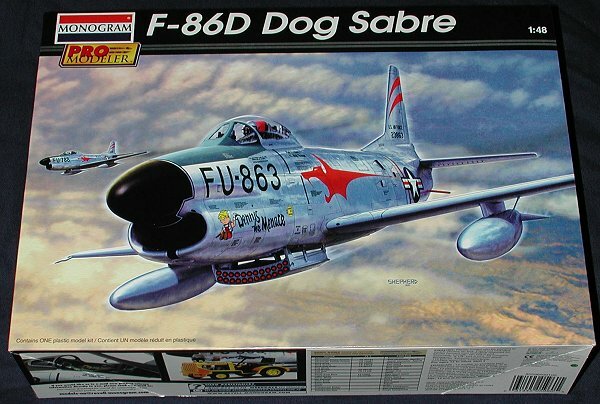 This particular kit is an early F-86D without the braking parachute. Theparachute was installed on all F-86D-45 aircraft and subsequent. This wasbrought about when it was discovered in 1953 that aircraft sent to the Far Eastwere unable to be used safely due to the shortness of runways. In late 1953, allearlier F-86Ds without the parachute were modified during a specially orderedIRAN (Inspect And Repair as Necessary) overhaul schedule. This allowedaircraft to be pulled from squadron use as soon as possible in order to get allF-86Ds up to a single standard. 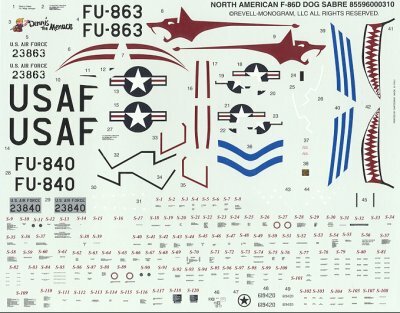 What this means to themodeler is that they need to be sure that any aftermarket decals used needs tobe matched to the plane and the time frame in order to be completely accurate.Many of us will gleefully ignore this little problem and happily build the planeas we like, but you do need to know this. Serial number buffs will want to knowthat F-86D-45 serials start with 52-3898 so any that are earlier and prior tothe IRAN overhaul that added the parabrake, will be applicable for this kit.This particular overhaul was started in July 1954 and all aircraft so modifiedby September 1955 under Operation Pull-Out (the USAF loves its special operationnames and probably has one for when the general goes to the bathroom!). 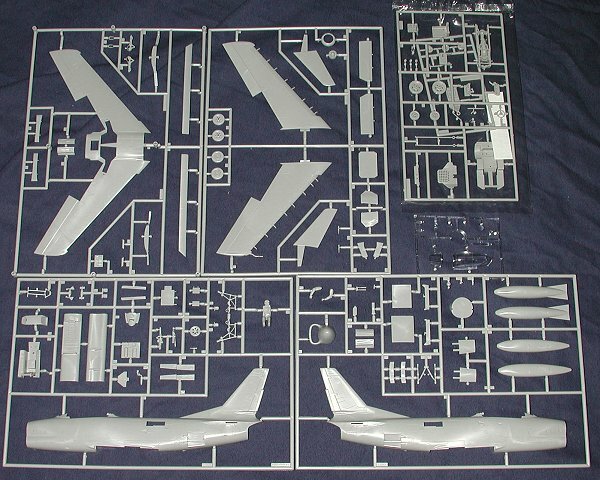 Those wanting to build an F-86L will have to wait for a wing upgrade kit or dosome heavy modifications. Part of the F-86L package was a slatted 6-3 wing,unique in the USAF to the F-86L. Not only was the chord broadened, but thewingspan was increased as well. 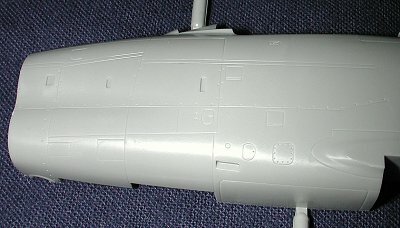 The two markings on the decal sheet are just as on the review ofthe build up. The box art plane is the 97th FIS and the other option is thecommanders aircraft from the 498 FIS. On this plane, you'll have to paint thetail and canopy frame blue to match the the fuselage stripes. You'll alsohave to paint the front of the drop tanks white and blue. There is an extensivesuite of data markings provided and the instructions on placement are absolutelytop rate as one would expect from ProModeler. This sheet is also superbly done,being very crisp and clear. This sheet is produced by Cartograf in Italy and isa major improvement over the often off-register Scalemaster sheets in previouskits! Overall, it is very much worth the wait and the delay. I'llbe joining the hordes in constructing this kit as it has moved very near the topof my 'to build' pile! If you would like your product reviewed fairly and quickly by asite that averages over 3,000 visits a day, please contactme or see other details in the Note toContributors.